But let’s face it, often it can be tough to stay focused on strategy. 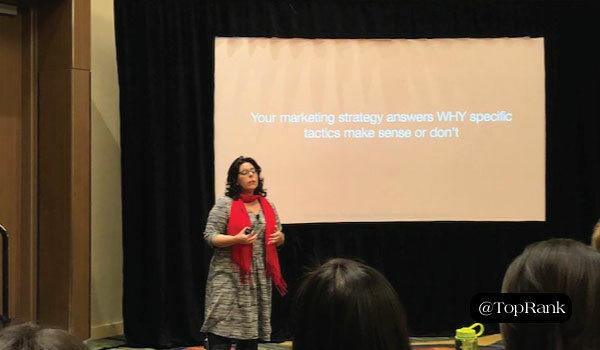 Fortunately, Samantha offers 3 tips to create a high-impact marketing strategy (regardless of where you’re at). Establishing your competitive differentiator seems like marketing 101. But something that seems simple, can be overlooked when working backward from revenue numbers. And can result in sales and marketing messages that miss the mark with your target audience. One mistake brands make is creating a competitive differentiator based on what they think is most valuable. Instead, this is a good opportunity to identify what customers and prospects consider to be the differentiator. Once you have your differentiator hypothesis you must validate it with the correct audience (your customers and prospects). Remember, your differentiator can’t be something you, your boss or CEO feels; it has to be something your target audience believes in. Many brands are still facing a disconnect between marketing and sales. Sure, there may be more conversations about lead quality and frequently asked questions. But fundamentally, most marketers feel like they’re delivering a flurry of activity; clicks, leads or social shares. But to sales, that activity may feel less like a flurry and more like a trickle. 66.7% of sales teams report that they are NOT rewarded for supporting marketing objectives. They are incentivized only for closing the deal, not all of the critical activity that happens nurturing a prospect to talk to the sales team. 57% of organizations report that less than 85% of leads delivered by marketing are followed up with by sales. This is likely because a portion of the leads delivered are not the right person at the right stage of the buying cycle. How do you fix the disconnect? Go directly to buyers. Breaking down the barrier between marketers and buyers results in better marketing communications, which resonates more with buyers (and sales). Leverage a variety of formats when communicating to sales. This matters more than the frequency of the meeting (i.e. email, centralized repositories, virtual and in-person meetings,etc.). #3 – Stop Being Accountable for Activity. Measure Impact. As B2B marketers, we talk a lot about leads. And leads may be easy to generate; with the right campaign, the right gated asset or the right event. But we aren’t really after leads; we’re after opportunities. In order to focus on the right types of activities, we need to ensure we are looking at the right metrics. For 2019 planning let’s focus on strategy first. By refining our focus on a meaningful and unique value proposition; we can better align with sales to drive the right leads and then finally set goals for metrics that matter. How are you setting goals for 2019 planning?